​Teach 'n Tag Movi can move here, there & everywhere—360 degrees of mobility! ​See his facial expressions change during play—60+ different faces! ​Teaches pre-schoolers following directions, critical thinking skills & gets them up and moving! "Let's Play!" 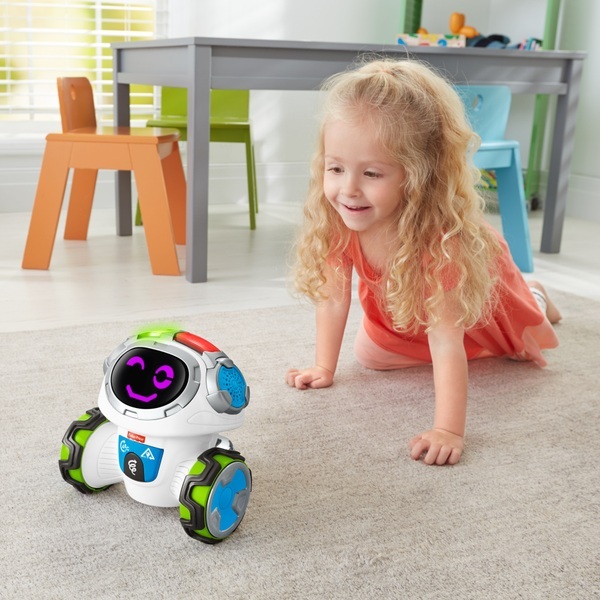 This cool little robot is ready to roll, and get kids moving and learning along with him! With 360 degrees of mobility, Think & Learn Teach 'n Tag Movi encourages pre-schoolers to get their minds and bodies moving while teaching them how to follow directions and think critically about the world around them! With 3 exciting game modes and 6 games to choose from​, Teach 'n Tag Movi keeps kids thinking (and moving! ), whether he's asking them questions to engage their critical thinking skills, prompting them to follow directions to a fun game, or getting silly on the dance floor and showing off his smooth moves. Kids will have a blast showing off their awesome listening skills and rockin' moves with this interactive learning robot! Development also comes into play. With active games like "Red Light, Green Light" or "Movi Says", kids practice their listening skills and following directions. When Teach 'n Tag Movi asks kids to think about an object and asks what shape that obect is, he's encouraging them to use those all-important critical thinking skills! Whether it's an all-out dance party or pretending to be different animals, Teach 'n Tag Movi gets your pre-schooler up and moving!